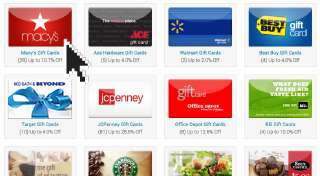 Shop the Raise gift card marketplace to buy discount gift cards online. The more you buy, the more you save! 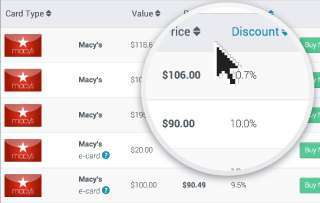 As you search by brand name, product category, discount percentage, or recent listings, notice the number of available gift cards and highest discount per brand. Click on the gift card image to view the types of cards listed for sale and learn more about each brand’s product offerings. Each listing displays the full value of the gift card, the seller’s asking price, and the percentage of money you’ll save. Physical gift cards will be shipped to you by mail for in-store redemption, and eGift cards will be available electronically in your Raise Account for online redemption. Take note: many eGift cards can also be printed and used as an in-store voucher. Select a gift card and click “Buy Now” to add it to your shopping cart. Continue shopping to buy more gift cards from various brands.